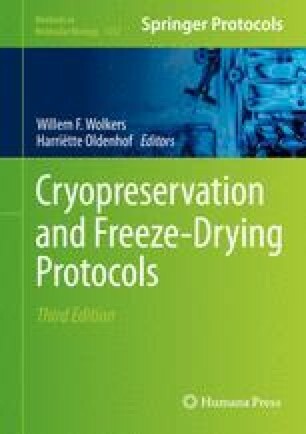 Differential scanning calorimetry (DSC) is a commonly used thermal analysis technique in cryopreservation and freeze-drying research. It has been used to investigate crystallization, eutectic formation, glass transition, devitrification, recrystallization, melting, polymorphism, molecular relaxation, phase separation, water transport, thermochemistry, and kinetics of complex reactions (e.g., protein denaturation). Such information can be used for the optimization of protective formulations and process protocols. This chapter gives an introduction to beginners who are less familiar with this technique. It covers the instrument and its basic principles, followed by a discussion of the methods as well as examples of specific applications.